Since 1926, Soroptimist International of Vancouver has been committed to improving the lives of women and girls locally and internationally. 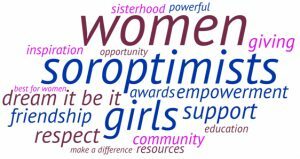 The name Soroptimist means “best for women.” A group of professional women, Soroptimists are women at their best helping other women to be their best. The club has a Board of Directors and club members serve on a variety of smaller committees to achieve the goals of the club. Committees include service programs, awards, membership, publicity, fundraising, and more.